Here it is, December already! Where did November skitter off to? It seems only yesterday I was excited about seeing my children at Thanksgiving, being disappointed at only having two families show up, living through it, and now it is that most beautiful season of all, Christmas! My season started early when my daughter, my son, and two grandchildren put up my tree right after turkey day. The village, which was my hubby’s pride and joy, also appeared with a few changes. It was becoming over-populated, as he could never resist buying one more building, a few more people, some more trees, and on and on. So my daughter kept a couple of buildings out, and some residents. I only asked that she keep the nun he always put in front of the church. The scene is beautiful, and fills my heart with joy every time I see it. It might not be traditional, but our village also has a casino! I will be traveling to Dallas to spend that most holy of days with my family, the only one absent will be the son who lives here and my grandson, and I will miss them dearly. My consolation is that I see my son daily, and my grandson on week ends. 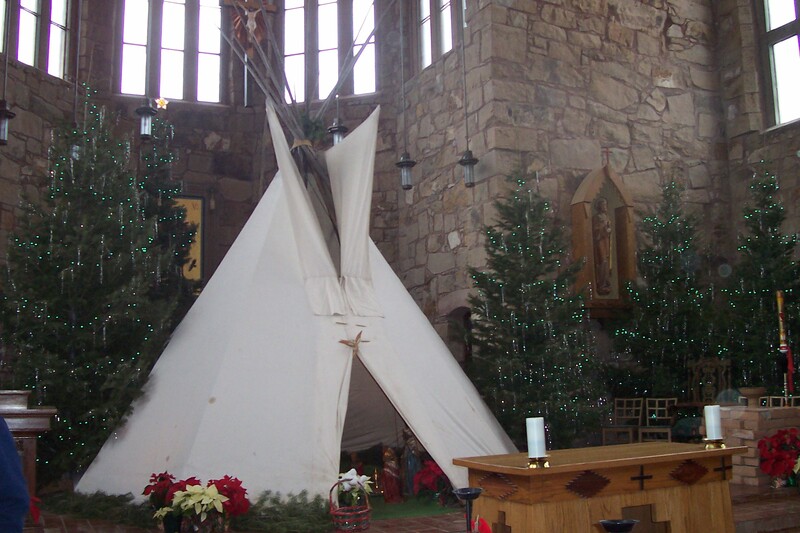 I will get to see my church, St. Joseph’s Mescalero Apache Mission, decorated with the traditional tee pee at the altar, housing the Holy Family, surrounded by scores of pine trees with blinking lights, and the pews with their garlands. It is a beautiful sight. My hubby loved to take pictures, and one year we used the scene as our Christmas card. So I am preparing for my trip, my children bought my ticket back in September. I should not have any problems, but with the new security set up at the airports,(am I really going to be personally searched that much? ), and the number of people traveling, my son in El Paso urged me to drive down the day before, not at six in the morning as I had planned. So I checked with my office, and they said it should not be a problem. I AM WORKING, YOU KNOW. I love to say that! The season of peace and love is upon us. My wish is that all the hoopla, the ads, the continuous pounding of BUY, will not affect us so much that we forget what we are celebrating; the birth of the Baby Jesus, the Savior of the world. Hold your family tight, and tell them you love them. Love your neighbor as yourself, and see the good in all. What a wonderful world this would be if we all adhered to that mantra.